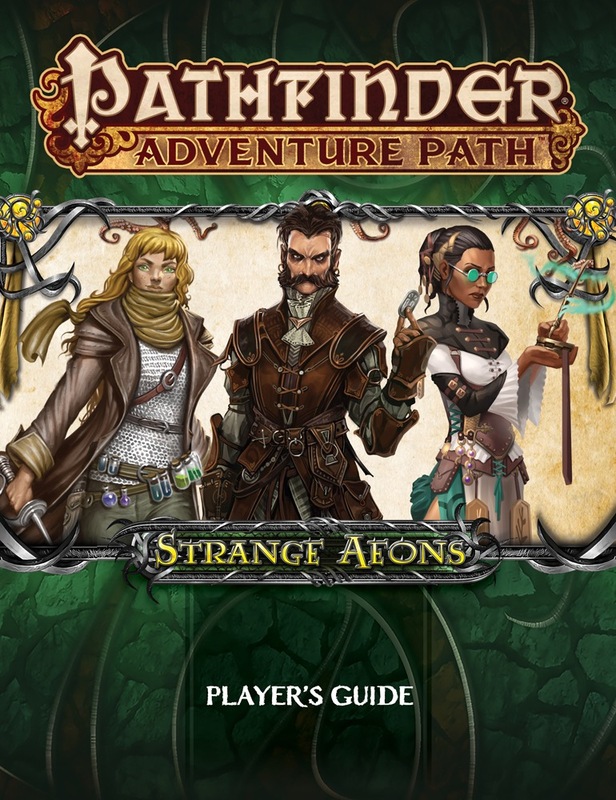 The Strange Aeons Player's Guide provides players with all the spoiler-free information, inspiration, and new rules they'll need to create characters prepared for dealing with the horrors and mysteries of the Strange Aeons Adventure Path. 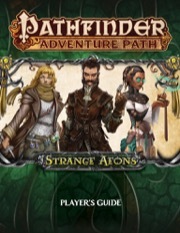 Within, players of this campaign will find everything they need to create backgrounds tied to personalities and events vital to Pathfinder Adventure Path's exploration of the unspeakable depths of cosmic horror, along with new campaign-specific traits to give brave heroes the edge they'll need to take on the dangerous threats faced in the Strange Aeons Adventure Path. This player's guide also includes a glimpse of the town of Thrushmoor, as well as various class options and advice for characters ready to delve into madness. Wake up from your nightmares and let the Strange Aeons Player's Guide start your path into the unspeakable! I can't wait to start running this! *This players guide does a good job of setting expectations for both players and GMs. the fugue state the PCs begin the AP in. right away, and does a lot to reassure players concerned about it. *It makes useful suggestions about races, classes, archetypes, etc which are most appropriate, as well as giving ample warning against inappropriate choices. *This guide offers just enough information to get the players hooked without over-sharing. *Any way you slice it, this AP will intrude on the Golden Box of player agency. Players and GM will have to work together much more closely to tell a good story. *Some of the Campaign Traits are unusually powerful, and may even diminish, rather than heighten the PC's feelings of dread and paranoia. *While Horror Adventures gets a few well-deserved references to new mechanics, this guide should have come right out and assumed the use of HA's expended fear rules, as well as the sanity mechanics. A brief discussion of the expanded levels of fear from a player's perspective would have been appreciated as well. If nothing else, a link to those mechanics in the PRD would have helped. *It has been noted that the 'hook' that begins the first book makes PC motivations vague and party cohesion much more difficult. After all, since PCs can come from anywhere and have been doing anything before the Bad Thing happened, there's nothing to tie them together as a group, right? While that can be true, I view this as a feature rather than a bug. Yes, RPGs are intended to be 'team' activities, but in this case, the implication that your partymates may not be completely trustworthy adds to the dramatic tension rather than detracting from it. Even as the 'hook' is resolved and PCs learn more about what's going on, the idea that "this problem is bigger than our potential interpersonal issues" gives the PCs reason to stick together, even though their various origin stories may suggest otherwise. you may not *like* everyone in your group, you may not *trust* everyone in your group. But they're still part of your group. Until they aren't? The guide has an unfortunate start, focussing on the fugue state and offering little reason to look forward to the campaign - beside luring with Lovecraft. While it was recognized the fugue state can be a problem for players (perceived control loss), only a single sentence is spent on potential positive side effects. To be fair, players can opt out of the fugue state, but the additional work then is appearantly left to the GM and players. Hmm. Players are encouraged to take a weakness / vulnerability for their characters - I would have liked some examples. Maybe the existing drawback trait system could have been used, unlocking an additional positive trait later on. Things get better afterwards, with an extensive list of recommended archetypes and a fair warning about many fear effects making psychic magic more difficult. Core races are encouraged, but wouldn't horror help to integrate exotic races - since all feel in the same boat? The campaign traits are the highlight for me, they are both creative and unusually powerful. Maybe the latter is supposed to compensate a bit for the messy situation the PCs are in. Finally there is some nice brief introduction into Ustalav. I stumbled over an oddity when reading both the guide and part 1 of the AP: A sequence of sentences is completely identical. Given the different audience, it's not a dealbreaker, but it's odd. So this guide works to introduce players who are already interested in the campaign, but it probably doesn't convince many players on the fence. I think fugue is a good idea, but it should have been presented more positively. The start of the Player guide gave me a lot of hope, as descriptions were rich in flavor. The problems started with the traits that were given. A lot of the flavor and strenght of the situation was detracted from. The start paints a picture of a character who isn't sure of himself, yet most traits imply that you're rather calm and collected about the whole afair and with absolute certainty about how you resolved things in the past. It also provides so many traits that imply that you're not even afraid of your current situation. It also suffers from a lack of art that would evoke the flavor and theme of Lovecraftian horror, a lot of it was reused, which while obviously not an uncommon practice, was particuarly poorly picked. A lot of interesting plot points or character development were also cut of. The example of someone of faith who feels to have sinned against that faith, no longer caring in the slightest about it completely detracts from any implications that might bring with it. you still have your spells, so it wouldn't affect gameplay, and now it won't even affect story. In the end I cannot help but feel that it would've been much better to go into the first adventure completely blind. As that might have evoked the fear and mystery that is so typical of Lovecraftian horror. And now that is gone. A strong start completely detracted from by its second half. This PG does an excellent job of helping players ease into the opening of the AP, which is by no means typical for a D&D campaign. I like how it foreshadows things without spoiling them and ensures that players are mentally prepared for the first adventure. It also provides the usual tips for character creation, traits and a brief outline of Ustalav and the nearby surroundings. I've perhaps wished that the Ustalav outline was a little longer, but then again this PG is short and sweet at 12 pages, which seems about right. Honestly, I wasn't very impressed with this one. Reading through it, I think I actually lost interest in the AP instead of building towards it. It felt too much like product placement for the Occult Adventures material instead of focusing in on Lovecraftian or Horror concepts, and a great deal of the advice comes down to trust us and trust your DM, which would have been better, I think as a discussion aimed at the DM in the product itself, and how to talk to their groups up front, rather than a plea towards the potential players. It offers a heck of a lot of suggested options, but very little reason why they are good, how they will matter, or ways to really help other than just a name. It also seems to ignore, (maybe they forgot they existed) others which one would imagine would be really good fits. Too many suggestions also make it very meaningless. Reading through it, it also really seems that whoever wrote the guide also has little idea of what is coming, and the later sections and mechanics/options seem to strongly disagree with a lot of the flavor and mood that early sections suggest, (or at least implied). All in all, this was a very weak guide that seems to miss the mark. And while (not a complaint directly about the guide itself) it's cool we are finally going back to Ustalav, we are also told up front not to expect to stay there long, and again seems to strongly imply the goal is to focus on Occult Adventures aspects rather than Horror Adventures. Wow, how did I miss that this was available? It just went live like an hour ago, so you're not late to the party by any means. Pugnacious is an awesome trait. ... I wonder how many people are gonna try filing the serial numbers off of that one to use in other APs? Very interesting and some very cool traits. "To communicate with some of the stranger enemies in this campaign, learning Aklo might help, but the language of aberrations and dark fey is an unusual skill for beginning characters and requires a solid justification." ...Why does it require player to justify it when PCs start with amnesia where they barely remember anything? Including possibly them having a companion animal/eidolon? In fact, the mystery of your amnesiac character saying: "I know what they're saying! Why do I know what they're saying?" Seems pretty ace. Thanks, Mr. Daigle & team. Looks alright but I wonder how many of the suggested classes are trash that will just screw you over, like the Blight Druid in Iron Gods. Thankfully there isn't a kingdom build/rebellion management/wagon train management thingy in this one that is essentially a one player facebook game that can be removed with no impact on the game. They're learning. Okay now tell us how you really feel. Plus the answer to the question could be also terrifying in its own way. Like "you know how to speak Aklo, because a Mi-go science team implanted something into your head that had the side effect of translating their language and writing(as per dark seed)." Sign me up for some Formerly Mind-Swapped! Yithians are my favorite Mythos race! I plan on playing like Jack Walters from Dark Corners of The Earth. Holy..! Is it just me or some of these traits really powerful? "True devotion" almost seems like a full on feat to me.